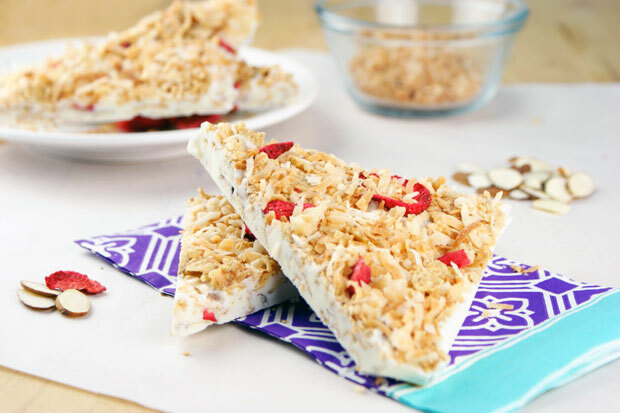 A light and tropical bark loaded with strawberry-cornflake cereal, sliced almonds and toasted coconut! 2. Stir 1 cup of cereal and almonds into coating (reserving some cereal/almonds to sprinkle on top). 3. Spread mixture approximately ¼” thick onto wax paper. 4. Sprinkle with remaining cereal, almonds and toasted coconut; let dry. 5. Once completely dry, break or cut into small pieces to serve.